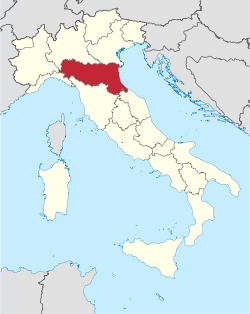 Considered the southern part of northern Italy Emilia-Romagna is a dual region resting on rich and fertile flatlands that stretch from the Ligurian border down to the Adriatic Sea. It is home to many treasures of Italian cuisine such as Parmigiano Reggiano cheese, Tortellini, Prosciutto di Parma, Mortadella and Salame Felino. Similar to Trentino – Alto Adige this region is very much two personalities with different wines, traditions and history. Emilia occupies the western sector and Romagna begins just east of Bologna and ends at the sea. Emilia is the distinctly flatter side of the region that produces the fizzy red wine Lambruso. Given its terrain it is not suited for proper drainage and water stagnation has been a historical issue. These conditions are what led to the birth of the “wild vine” vitis labrusca (Lambrusco). Unlike the more common vitis species vitis vinefera labrusca is not negatively affected by poor drainage. This unlikely dna transition from vinefera to labrusca has been widely celebrated locally and abroad. Without it this region would have been doomed to poor quality wine and the world parched of frothy red ferments. Throughout the west you’ll find five major sub appelations for Lambrusco production encompassing varying styles and profiles. Traveling east into Romagna the land takes on contours and is composed of more hillsides. Known for high quality traditional varieties like Sangiovese as well as for indigenous obscurities like Albana and Pignoletto. Some areas such as Colli Bolognesi have been blessed with abundant sandy soil which has provided the defense against phylloxera and the preservation of native rootstocks.